SMSC February is up together with January poll (have you voted?). This month the topic is Amazing Urban Planning, remember that the image limit is slightly bigger now and to use a free license. Takasaki is a mostly large city one of my fictional map. Used pak is my original trains and wa's box station buildings. Incidentally, my original trains are named "seikai electric railway"
Spanish city planner Arturo Soria developed an urban planning theory in the second half of XIX Century. His idea was to link old cities by linear city. Wide streets making triangles, with industries inside. The linear city has only a street, an infinite street (from Cádiz to Saint Petersburg, said Soria). At that street all the houses are detached; all the social classes share the space, but each family has a house and a land. That street has a railway at the centre. Arturo Soria's real project was a ring linear city around Madrid, and a circle railway line from Fuencarral to Pozuelo de Alarcón. He founded the Compañía Madrileña de Urbanización (CMU). The linear city was built at the Norh-East of Madrid, at the town of Canillas; in fact, it was called Ciudad Lineal (Linear City in Spanish). Also, Soria's company built a tramway line from Cuatro Caminos to Ventas, through Tetuán and Chamartín. During the forties, the towns around Madrid were joined to the city. In 1952, EMT (City Counsil Transports Company) became the owner and manager of the CMU tramway lines. Later, the urban growth arrived to Ciudad Lineal, and nowadays is another area in Madrid. Obviously, the street is called Arturo Soria. 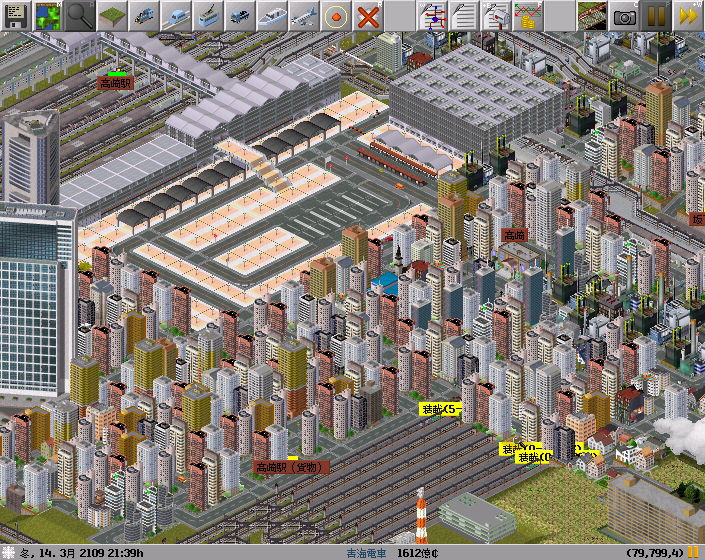 This screenshot is a created scenario and shows a linear city with a elevated railway, a central boulevard and detached houses. - Pegaso 6035/A-1 (articulated bus). - Pegaso 6050 (standard bus). - Ebro M-125 (yellow and grey truck). - Renfe Series 269-200 (yellow-blue electric locomotive). - Renfe Series 444 (passenger train). Under CC BY-SA 3.0 license. New York City is practically the definition of an urban city. Especially, Manhattan is an island that is packed with skyscrapers and millions of people packed inside. The only reason it is sustainable is because it has a complex underground subway network. It is from a real game with the North America 5120x3276 tiles map. In this screenshot, you can see the underground metro network. The real NYC has more than 20 lines, but I have simplified/regrouped them. NYC Metro Line 1, 2/3/5, 4/B, 6, 7/F/G, J/Z, N/R, LIRR Montauk Line, AirTrain, conventional highspeed rail from Manhattan to JFK and a futuristic NeoAcela Monorail service. 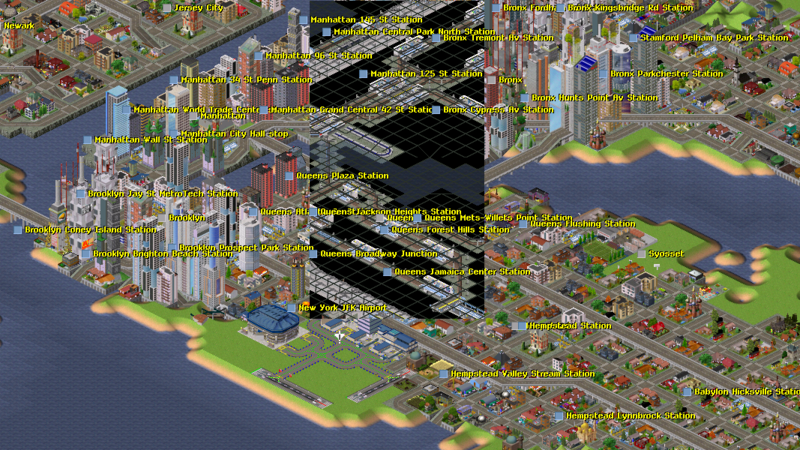 Pak128 with Monorail and Taller Buildings Addons. Carmarthen was the biggest and busiest city of the country. As Capital, was the first to have an airport. Over time, the city lost some influence, and was overtaken by some peripheral cities, like Telford and Leeds, and lost the Capital status to Weymouth. With the new Mayor election, Carmarthen invested in urban planning, and rethinking the transport system, inner and outwards the city. The vision was a major Hub, connecting the city to far locations. The first step was improving, the already existing, high-speed train line, to trains of up to 380km/h. Making the station larger and able to receive more trains to connect the city to more locations. Then, with the help of the Government, the city invested in a Maglev system (525km/h): with a Line covering the all Country and another Line bringing people from the South East faster and more comfortable to the city. At this stage, the city brought a Ultra-speed Monorail Line (750km/h), making International connections. But the most important improvement was the construction of the new Airport, adjacent to the South Hub, making the city centre less congested, and - with the destruction of the old airport - making way to new investments in the city. Carmarthen is on the rise! PS: This is from a real game. Pak128.Britain with many addons. I give permission to use this image as you want.